Aged 3, Frances Evelyn Maynard inherited enormous wealth on the deaths of her grandfather and father. Her early inheritance gave her an income of £30,000 a year and a large estate in Essex, centred on the Victorian mansion, Easton Lodge where, after her majority, she improved both the house and gardens. Marriage to Lord Brooke, (later Earl of Warwick) brought further wealth and also an estate at Warwick Castle. Lord and Lady Warwick, as members of the Marlborough Set, gave many house parties at Easton Lodge, and it was there that Daisy and the Prince of Wales conducted much of their love affair between the years 1888 to 1897. Daisy had other affairs, and she was nearly disgraced when incriminating letters became public and litigation followed. COUNTESS OF WARWICK, UNKNOWN PHOTOGRAPHER, C.1895, NPG. The agricultural depression of the late 1880s reduced the income from Easton Lodge estate and caused huge hardship in the area. A needlework school was set up on the estate with a London shop, both financed by Daisy. Further expressions of her interest in social welfare followed, and in1897, Daisy provided funds to open a secondary school, Bigods, in Great Dunmow, a co-ed boarding and day school specialising in science and agriculture. Losses and debts closed the school in1907. The first garden that Daisy designed were those at Stone Hall, a cruck cottage in the grounds of Easton Lodge, where a living sundial garden was built, with Shakespeare borders using the plants and flowers described in Shakespeare’s works. In 1902, architect and garden designer, Harold Peto was commissioned to design new formal gardens for Easton Lodge. The gardens, a series of interconnecting rooms were influenced by early French and Italian Renaissance gardens. However Graeme Moore, researching Peto for a biography, considered that Daisy was deeply involved in the designs for the garden, taking inspiration from Francis Bacon’s 1625 essay, Of Gardens. 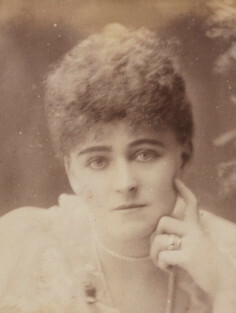 In 1904, Daisy financed the setting up of Studley Castle Agricultural College for women, after a successful trial in Reading. Her interests in the ‘millions of women’ without any income or prospect of advancement had been the subject of a newspaper article in 1899, when she had tried to enlist the support of her ex-lover the prince of Wales in a scheme to establish ‘colonies’ of women market gardeners. Studley Castle was one of the longest running women’s agricultural colleges, closing in 1969. Daisy wrote numerous articles including pieces in the Women’s Agricultural Times. She also wrote on the subject of history and gardening including and An Old English Garden, 1897, Warwick Castle and its Earls, 1903. Later in her life Daisy published several autobiographical pieces including Life’s Ebb and Flow, 1929 and Afterthoughts, 1931. She also wrote a novel entitled Branch Lines, in 1932. In 1918 a severe fire saw much of Easton Lodge destroyed and her own finance depleted. Throughout the remainder of her life she continued to live in straitened circumstances at Easton Lodge giving socialist conferences and week-end parties and converting much of the park and grounds to a sanctuary for birds, wildlife and ponies. Daisy died in 1938, leaving an estate valued at only £37,000 to her younger son, Maynard Greville.